When it comes to food, are you more the adventurous type or the type that gets the same order at the same restaurant each visit? Arguments can be made for both. Some people know what they like and they stick with it, but others are like me and would rather try something new, even at the risk of not being happy with it. After all, how can you know if something is good if you don't try it? I learned to like trying new foods from my wife, who is a talented cook with a sense of adventure. 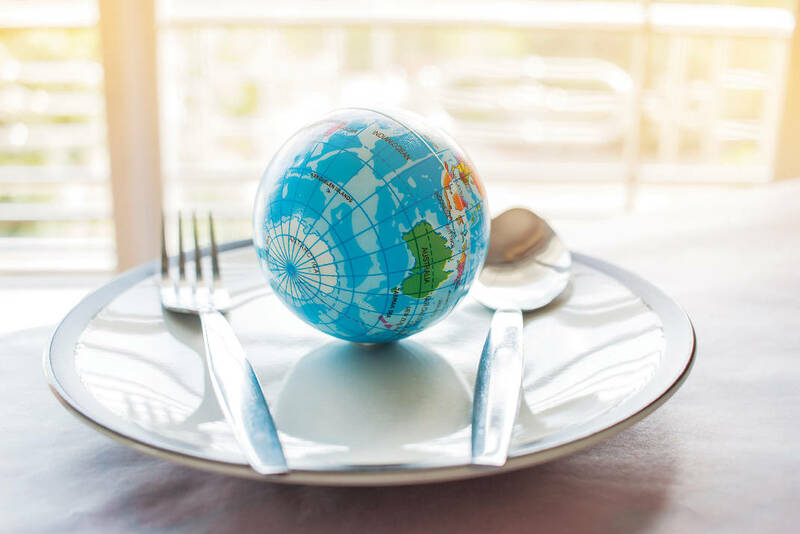 It is not uncommon in our household to randomly pull a cookbook featuring foods from around the world and let the pages fall open where they may and then try to replicate the dish. Or, at least adapt it. She never follows a recipe exactly and also never makes the same thing exactly the same way. Recently, for example, we attempted to make pupusas, the Salvadoran staple that are essentially a large tortilla stuffed with things like cheese, meat, rice, beans or spinach and lightly fried. She took up the challenge after hearing me rave about Pupuseria Marelyn on Dodds Avenue. It was recommended to me by a fellow food adventurer who loves finding the best places to eat, no matter their location. We are not chain restaurant people. Not that there is anything inherently wrong with chains if, like I said, you know what you are going to get. It's just that we'd rather find the gas station selling tamales or hot dogs or potato logs, or a cow tongue taco out of a food truck. Or, maybe a pho place with a really confusing name, or a Thai place in a strip center in a non-trendy part of town. Ethnic foods seem to frighten some people, but I find that except for the truly exotic dishes, which is of course relative, the dishes are made with ingredients familiar to most of us. They are just prepared and flavored differently. Things like steak, rice, beans, tomatoes, lettuce, onions and even many herbs are found in many foods around the world, but the way they are combined in El Salvador is quite different than in Mexico or Greece. Point being, many people seem scared off by the thought of eating something unfamiliar, when for me, that is the fun part. Many mainstream places offer what I consider ethnic dishes now. The Bitter Alibi has quite a few, such as a Korean Cubano or chorizo burrito, and Kenny's comes the closest to serving a good Vietnamese banh mi, which I consider the greatest sandwich in the world since the PB & J, though I'm still searching for a truly great banh mi to rival my wife's. But for those who aren't scared to venture off the beaten path (and plate), here are the places I consider truly ethnic and which I've actually tried and will vouch for. » Pupuseria Marelyn, 1622 Dodds Ave. This South American-based restaurant perhaps best defines adventurous dining for me right now. Maybe that's because it's the latest find, or maybe it's because of the barbed wire that tops the fence surrounding the parking lot. In reality, it's because the menu features delicious foods that are new to me. The pupusas are terrific, and the sopa de mariscos, a rich, creamy soup filled with all manner of seafood, is pretty great. » Conga Latin Restaurant, 26 E. Main St. 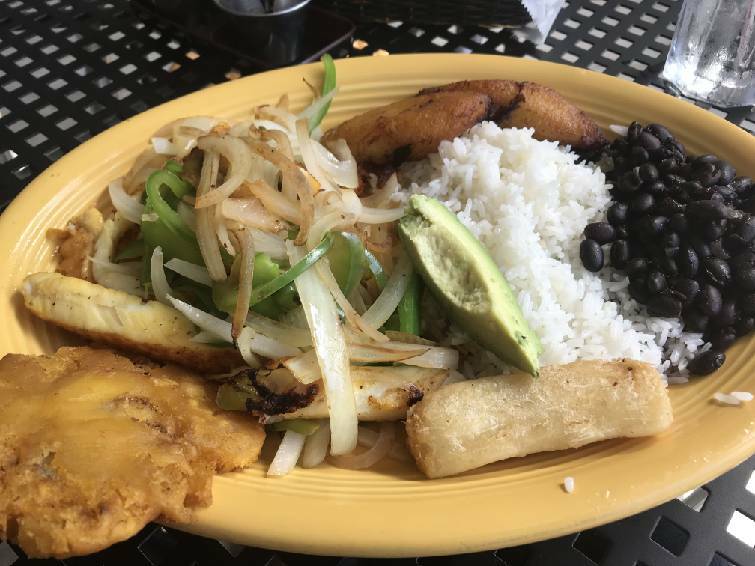 Specializing in pupusas, ceviche and Latin American food, Conga's platters are excellent for sampling. » Tacos el Chilango, 3646 Brainerd Road Another fairly recent find for me. The pozole (soup with hominy) and tortes (giant sandwiches) are both delicious. The restaurant offers 10 types of tacos, so if you've wanted to try cow tongue tacos, they have them. I'll stick with chicken, or beef or pork, but they aren't bad. » Taqueria Jalisco, 1634 Rossville Ave. and 850 Market St. This has been the standard-bearer for many people for several years now for "real deal" Latin food. The tacos and bean burritos are simple but flavorful. » Mrs. B's Reggae Cafe, 3103 Broad St. Chef Neville has long been a local favorite, and he and his wife Marilyn Forsythe, who helps run the restaurant, are both Jamaican. So it's no surprise that this place specializes in Jamaican foods like jerk chicken, lollipop jerk wings, and curry dishes such as shrimp curry with white rice and vegetable medley or curry chicken roti. Try it all. » Opa, 249 River St. 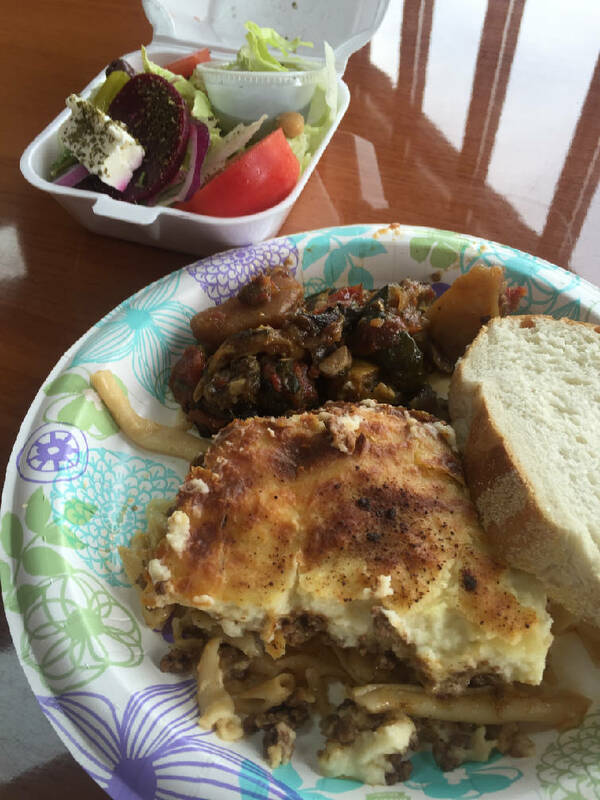 The authentic Greek menu offers two adventures in one, as the prices of dishes, and the dishes themselves, can change from visit to visit. The Opa Platter is a standard, piled high with Greek favorites like lamb, chicken, grape leaves, pita, humus, Greek salad, Kalamata olives and spanakopita, which is essentially a flaky spinach turnover. Don't labor over the menu, just get the platter (a vegetarian version is available as well). And go hungry. It's really good. » Olive Branch, 3992 Ringgold Road. This place also serves Greek food, but it is different than Opa. Olive Branch is what I imagine going to someone's home for a big Sunday meal would be like. 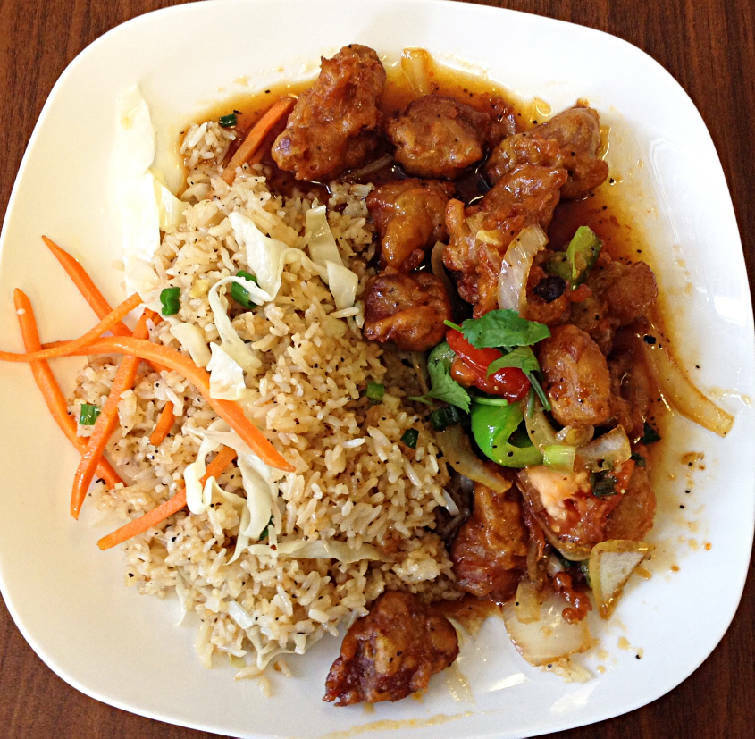 The lemon chicken and chicken livers are favorites; several hot dishes are offered on a rotating daily basis. The place also features a grocery store, bakery and deli. » Chopstix, 6903 Lee Highway. My wife and I have had takeout from here twice and we vowed to return whenever we are in the area. Chopstix offers Korean and Vietnamese dishes. The beef pho, which is a giant bowl of broth that you add fresh bean sprouts, lime, jalapenos, cilantro and basil leaves to, was very fresh and tasty. » Cafe & Toast, 3536 Cummings Highway, No. 180. Easily one of the strangest names for a place I know of, but the Singapore and Vietnamese dishes here are really good. Especially the pho. The eatery's name relates to the roasted coffee and Singapore toast originally served when the restaurant was founded in the late '60s in Singapore. » Thai Esan, 4330 Ringgold Road. When my wife asked the owner of a nearby Asian market if she had eaten at Thai Esan, all she said was, "She knows what she's doing." The curries are terrific, as is the coconut soup. The papaya salad is like nothing else I know. The pad kee mao, which is also called Drunken Noodles, is outstanding. Be careful of the spice, which you order in numbered levels up to five. "Three" is as spicy as I can go, while "two" is the norm for me. I like spice, but not so hot that I can no longer feel my tongue or taste the food. » Sawasdee Thai Restaurant, 4008 St. Elmo Ave. Eating here can be an adventure both because the food is so good and the staff has no problem telling you what you can and can't order, or that it's time to go. Pad Thai, or pud Thai as is it listed here, is essentially the gateway dish for most people around the world for Thai food, and it is really good at Sawasdee. The dish is relatively simple with rice noodles, egg, bean sprouts, tamarind juice, ground peanuts and spices and served with tofu, chicken, pork or shrimp. » Alex Thai Food & Sushi Bistro, 26 E. Main St., No. 114. Like Rain, listed below, Alex serves what I consider Americanized versions of Thai dishes. I would recommend getting the pad Thai if you're new to Thai food. » Rain Thai Bistro, 6933 Lee Highway. Rain's menu is a fusion of Asian dishes offering sushi, stir-fry, and Thai curry dishes like panang curry, which features bell peppers, peas, carrots and basil cooked in a curry in a peanut and coconut mild sauce. 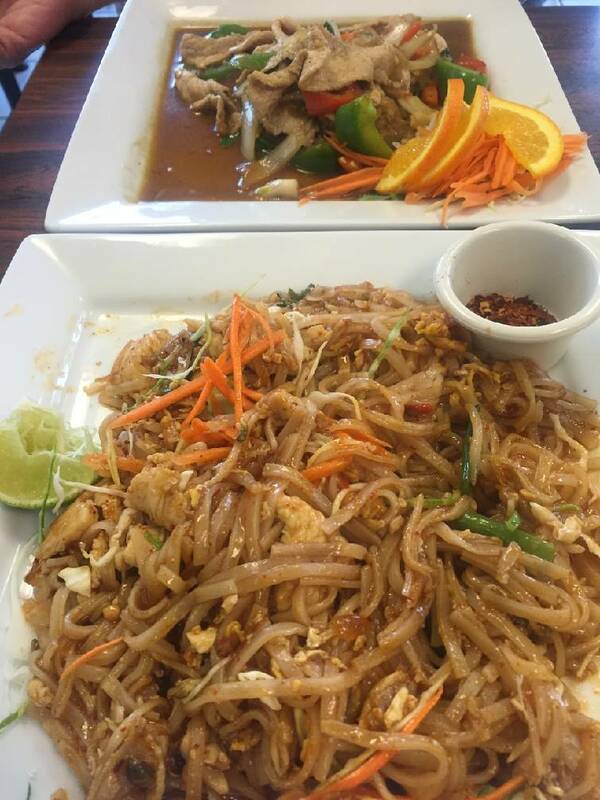 » Sweet Basil Thai Cuisine, 5845 Brainerd Road. For awhile several years ago, this was as good as it got when it came to Thai food for me. The dishes were beautifully presented, with radishes cut into flowers as decoration, for example, and the food prepared with the same care. The quality dropped as staff returned to Thailand several years ago, but it was delicious when I was there a couple of months ago. When it is good, the catfish sauteed in basil, Thai eggplant and spicy fresh peppercorn sauce is outstanding, so much so that non-catfish-eating members of my family love it.